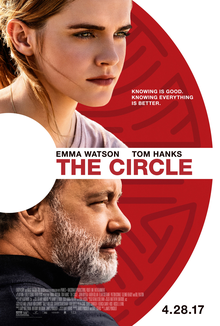 We're happy to offer our DC readers the chance to win an Admit-Two Run of Engagement (ROE) pass for The Circle, starring Tom Hanks, Emma Watson, and John Boyega. The film is directed by James Ponsoldt (The Spectacular Now) based on a book by Dave Eggers. Synopsis: Mae Holland (Emma Watson) seizes the opportunity of a lifetime when she lands a job with the world's most powerful technology and social media company. Encouraged by the company's founder (Tom Hanks), Mae joins a groundbreaking experiment that pushes the boundaries of privacy, ethics and personal freedom. Her participation in the experiment, and every decision she makes soon starts to affect the lives and futures of her friends, family and that of humanity. These ROE passes are valid Monday-Thursday at DC theaters beginning Monday, May 1st and lasting through the film's theatrical run. If you'd like to enter, simply send an email to punchdrunktrav@gmail.com with 'The Circle ROE' in the subject line. Please include your name and full mailing address. Winners will be selected tomorrow, April 28th, at noon and contacted by email. Good luck! The Circle opens April 28th.